We've been talking about the Fed potentially becoming progressively more hawkish (maybe at the most inopportune time). This has started to materialize. In addition, subsequent central banks around the world (ECB, BOE, BOC) are echoing the same rhetoric. We are currently witnessing a reflexive process unwind. When countries were engaged in a currency war racing to devalue, one central bank devaluing their currency would in turn indirectly force a relative tightening of financial conditions of another country. In turn, the second country would have to ease monetary conditions, creating a positive feedback loop. Now, we are on the other side, where central banks have realized that financial conditions might be too loose and asset prices are noticeably overvalued. So now what? We now have started an unwind of the reflexive process with a positive feedback loop in the other direction. One country raises rates attempting to tighten, thus making the financial conditions of the other countries relatively looser - as a result, the other countries must then be forced to tighten. Of these central banks, the one that has been less aggressive in tapering and hawkish sentiment has been the BOJ. Looking at the lagging data, one might answer yes. But as speculators, it's paramount to project into the future. One of the most important triggers for higher inflation is the pressure behind rising wages that will propel core inflation. Looking at Japan, the number of job openings to applications is historically high. Historically speaking, the gap shown above in the late 60's and early 70's led to huge amounts of inflation. The same thing but on a more muted basis occurred in the early 2000's. In the data above, there was the time in the 80's and early 90's when Japan experienced a rise in inflation that manifested in the real estate and stock bubbles. The eventual popping of the bubble caused large deflationary pressures that overwhelmed any potential gains in inflation then. Then we have the early 2000's when inflation returned in Japan as they seemed to have finally started to fight off the deflationary bogeyman before 2008 threw a wrench of sorts into things. Looking at CPI, there seems to be some bottoming of CPI as it's started to pick up. One can also check the historical prints to reference my allusions earlier. Looking at the historical levels for JPY on a real basis. It seems to me that the currency is off the lows in regards to weakness in real terms (whether looking at it from a PPI or a CPI basis). Ultimately, with most of the developed world's currencies rapidly appreciating as a result of hawkish central banks trapped in a reflexive process of tightening, the one central bank that has been the least involved is Japan. That makes me want to go out and short the Yen against a number of currencies. Additionally, the fundamental inflationary pressures in Japan would concur in the justification of a weaker yen. Historically, the Yen has been a "safe haven currency" with flow into it when equity markets and risk sold off. It wasn't always so. The correlation back in 2011 between the SPX and Yen itself was actually positive. I'm looking at the 50 period moving average to smooth out a 10 day return correlation between JPY futures and E-minis. I am very interested to see if and when this correlation breaks down. With large negative delta in my portfolio towards equities and risk, I think shorting JPY is a good proxy hedge in case I am wrong. In addition, if that correlation of JPY outflow when risk sells off materializes, I will have even more conviction of a JPY short. The chart for the currency seems like it is setting up for a good entry point on the short side (long USDJPY) as well. I would look to buy it around now and hope to pick up some more around 111.50. Putting a stop at 109. Positioning wise, using CFTC IMM positioning as an indicative, people are without a doubt short the Yen. With that said, the amount short is not nearly as extreme as in 2013 or in 2007 (read, trade is not that crowded yet). Readers, what are your thoughts on JPY amidst the current macroeconomic/financial market backdrop? Is it going to strengthen or weaken? Vote in the comment section below. I may have said this before, but kudos to anyone who is committed enough to the craft (and the blog!) to take pics of charts in the public bloomberg. Of the big 4 central banks, the BoJ is the one that has the biggest output gap to deal with. And while there may be a labor shortage, the jury is still out on whether or not that will turn into inflation. And even if there are signs of CPI picking up, the BoJ is going to keep the petal to the metal in order to rebuild credibility and expectations around the 2% "target". 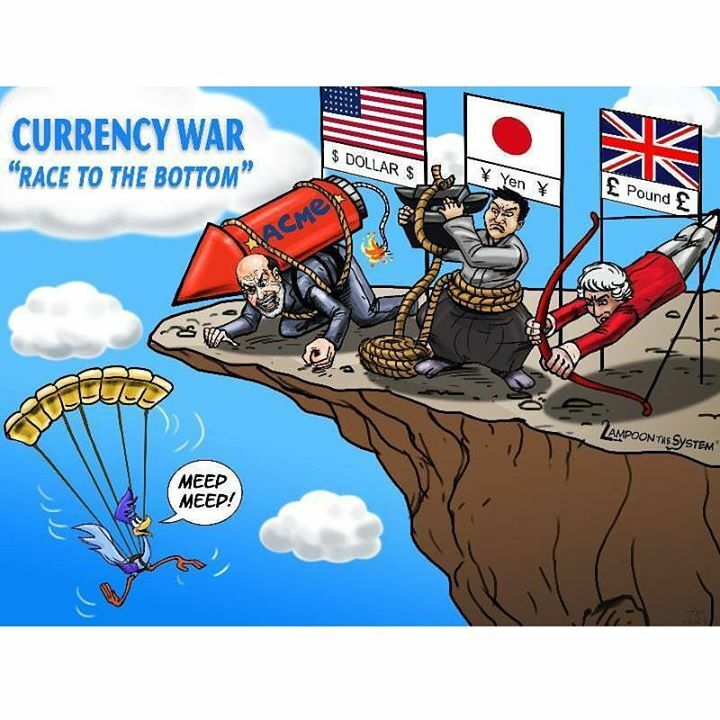 So it makes sense they've been the quietest on the hawkish talk or actually hiking, and the currency has lagged EUR, AUD and GBP and USD/JPY has kinda chopped around in a 109-114 range, where it is near the top. While I think it is possible, maybe even likely, that inflation picks up and rates remain in the gutter, leading to a weakening currency, I'm not sure the entry point is good here, especially in light of what should be a significant FTQ bid if markets take a turn down. The other threat would be if the BoJ *actually did* turn hawkish. That would catch a few people with their pants around their ankles. This also relates to your point about the technical position--I think the key there is not so much the IMM position but the billions in domestic assets have flowed out of the country in the last several years as savers fled low or negative rates and a persistent bias towards JPY depreciation. There is a ton of Japanese money in various carry trade investment vehicles that would be re-patriated if sentiment/consensus believed JPY would begin a secular appreciation. So I think there is a BIG short position out there--but not the one we usually think of if we are trading on one month time horizons. All that leaves me neutral here, I like it at the bottom of the current range, 110 area..."gun to the head" I'd be long usd/jpy but more driven by the USD side. But tough to love at this level in my opinion. Unfortunately, that all falls apart IF the BOJ take the next chair at the hawkish table. IF inflation is rising and the labour gap is as close as you suggest then they now have some justification to join the rest of the central banks. I think when the core of your argument is the reflexive nature of central banks then you need to justify why the BOJ won't also be responsive to that notion. "BOJ SAYS IT OFFERS TO BUY UNLIMITED AMOUNT OF 10-YEAR JGBS AT YIELD OF 0.110 PCT: RTRS"
What is the end game here? Anyone know? EURJPY/GBPJPY is trading better than USDJPY, IMO. I am short Yen as well. 100 is a big level, go back and look at the weekly's. We broke out, tested and now staying above. How the Yen manages to break 120 if rate differentials (now meaning US rates rise) dont widen I dont know. I was hoping strong global growth and a higher oil prices would push yen lower. But the time limit on that thesis is limited IMO, but still open. But I dont want to be short Yen before next risk off move, just bc.. Thank you for the post, DR. I feel I've read plenty of pieces lately arguing this way and that on the possibility of Japanese inflation picking up later this year. No view has coalesced in mind regarding an inflation pickup. IF it does, that should compress real Japanese rates as the BoJ is the only central bank to have committed to overshoot target. So, higher inflation => yen negative, not a catalyst for an immediate hawkish shift. In that regard, I like long USDJPY. But like Shawn, I'm not crazy about the level here because Ex-Japan DM rates are the key driver. My cynical view of markets was that the bund would break out of its range, draw in the chart-followers, and soon disappoint ... fixed income just doesn't trend the same way currencies do. Also, the bund year-end forward is now 75bps, which isn't so out-of-whack. The other issue for Ex-Japan DM rates driving USDJPY higher from here is where the EURUSD goes. Your USDJPY view has to account for the EURUSD level where Draghi turns more dovish. The higher EURUSD goes, the more likely you get a more modest tapering or just a step down to 40b/month. One other point. I've mentioned the central bank balance sheet narrative here before, and thrown in "BoJ stealth tapering." I actually have changed my mind on that. I think while we've seen a reduction in BoJ bond-buying, it'll probably pickup and run over its 80tr target as DM rates go higher and pressure the 10bps ceiling on the 10Y JGB. That said, I have read that Japan will need to taper because of depository institutions reaching minimum JGB holding levels later in ’18 -- anyone have a view on that, i.e. that Japan will face a hard constraint that forces tapering? Man, it is hard to read the comment section lately. Are you all mechanical or completely devoid of thought process? Need to bring back the A-Game guys. No need to worry any further.There is no A-Game to be played. It is game over. "We believe that the world has changed and consequently market behavior and the opportunity set has shifted for the foreseeable horizon. We feel we've identified some key developments that have caused certain inefficiencies to degrade, and, other opportunities to become more attractive. We analyzed our underlying portfolio performance over the past 18 months and we noticed some patterns that emerged. We have some notable observations about how things have changed and why strategies that were once working regularly have mysteriously stopped working. The bulk of our thoughts center around quantitative strategies and volatility oriented strategies." "With all the geniuses in quant, high-powered computers, and enormous data, where are the "suckers" who are providing the juice for all of these absolute return quantitative strategies? Simply put, the 'edge providers' have moved aggressively into passive index funds and broader market ETFs. As such, we have a condition amongst the traditional quantitative strategies whereby we have robots trading against robots. Without a steady source of 'edge providers', these 'edge demanders' are just trading money back and forth with each other. We believe increased quantitative trading coupled with passive indexation by retail, and, low levels of realized and implied volatility may be creating a feedback loop that has caused unusual price movements in a variety of securities that have challenged trading oriented strategies." Me sucker no more motherfuckers!